Word is that the DRC will not be considering the 35 Weybosset Facade at this month’s meeting, the applicant, O’Connor Properties, has requested a postponement. The next time the DRC may consider this is at the January 11th meeting. In the meantime, let’s take this chance to talk about what some of the options are for 35 Weybosset Street. In looking at options, there are a few things that need to be accomplished. These goals need not be mutually exclusive. A point of clarification on item four. The property owner has a prior agreement with the DRC to save the facade, that is a business decision that they agreed to be bound to. That agreement comes with costs. OK, OK, yes, this is a non-starter due to point 4. O’Connor (or probably anyone for that matter) cannot at this time afford to build OneTen Westminster. But damn, I wish they could. OneTen is untenable in this economy, but could something else be built? Probably, but it seems from O’Connor’s testimony at the last DRC meeting, that this is not a financial option for them at this time. Also, the last gasp attempt to develop this parcel was to chop the height in half and build a W Hotel. Something less than OneTen was already on the table and didn’t work out, moving on. Over at 159 Weybosset Street we have the Smith-Mathewson Building. 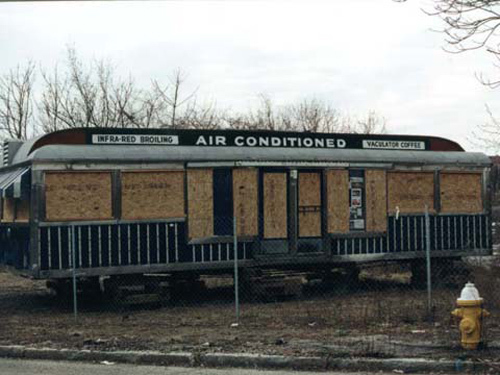 The owners of this parcel which was left vacant after the 2006 Downcity Diner fire were looking to park cars on the vacant lot. After it was suggested they look into putting a small liner building at the street, they are now building a 2-story 3,000 square foot retail building, engineered to be incorporated into a larger structure at a future date. 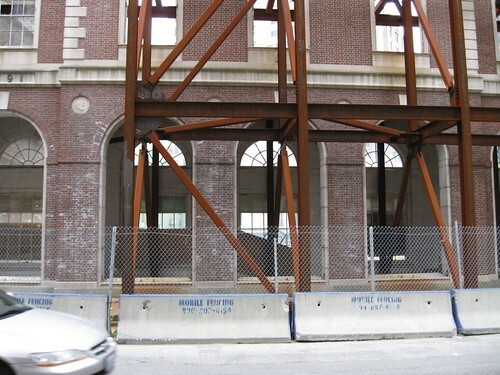 A transitional structure such as this could be built behind the 35 Weybosset facade. 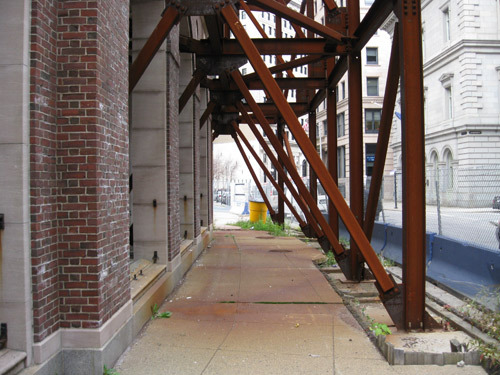 A transitional building would be able to hold up the facade, allowing the bracing along Weybosset Street to be removed and allowing the sidewalk to re-open and the street to be repaved. The building would provide O’Connor rental income and bring more life to Weybosset Street. 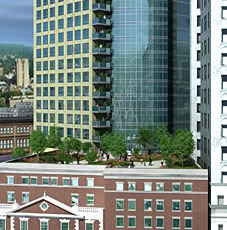 The original OneTen proposal called for only about 5 stories on the Weybosset side (two stories higher than the 35 Weybosset facade). This transitional building need only be engineered to handle that future load, not the 40-ish stories of the entire OneTen tower. Does this proposal prevent undue financial hardship on O’Connor? Well, the construction costs would have an impact, and not having access to O’Connor’s books, I cannot say if they can afford such a structure. All I know is that the developer down the street is making it work in this current economic climate, so it is not impossible. Flipping the bracing to the back side would allow the sidewalk to re-open and the street to be repaired. Can O’Connor afford it? 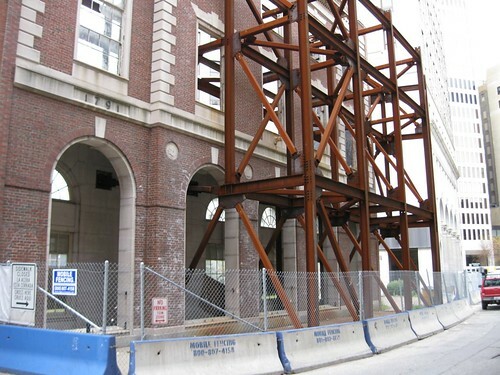 In testimony before DRC, O’Connor testified that it cost $500,000 to build the current bracing structure and guessed that it would cost $600,000 to remove the current bracing and build new bracing behind. O’Connor admitted that that was an estimate and it had not been bidded out. So even if it were to cost $600,000, is that too much to expect O’Connor to spend to hold up their end of the bargain that was originally agreed to with DRC? Are there other places available for them to receive grants, low-cost or no-interest loans, or other funding to do this? These are all questions that need answering before we allow the demolition of the facade. Leave the bracing as is? So what if the bracing currently in place stays in place? Points 1 (save the facade) and 4 (extreme financial hardship) are covered, but what about the street and the sidewalk? Looking through the bracing it is possible to drop down a beam from the slanted pieces at where it is around 8 feet above the sidewalk, blocking pedestrians passing under from hitting their heads on the lower parts. That creates a pretty narrow walkway though, not quite ideal. Can the sidewalk be placed on the outside of the bracing? Currently, the jersey barriers sitting between the bracing and the roadway are pushed back right up against the bracing. This makes Weybosset Street effectively about 1 and 3/4 lanes wide. Though parking is not allowed next to these jersey barriers (per signs posted on the fencing), there is enough room that cars and trucks sometimes park there anyway. This leads to a problem that the retailers brought up at the DRC meeting. When someone parks next to these jersey barriers and a bus or large truck comes up the street, they are blocked by the illegal parking. 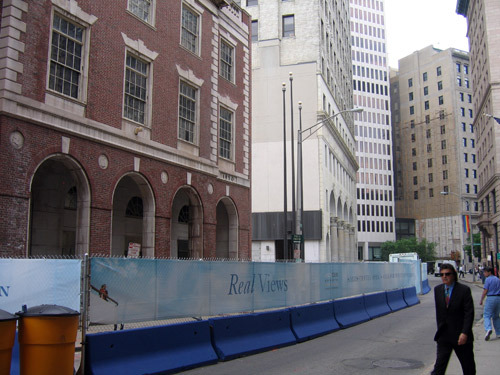 When the area was blocked off to the build the bracing, the jersey barriers were pulled out far enough to only allow for only one lane of traffic. The sidewalk could be swung out to the street side of the bracing, reducing Weybosset to one lane width only, making it impossible for cars to park illegally and impede the flow of traffic. Bollards along the sidewalk edge can ensure that trucks cannot mount the curb and hit the bracing (and also ensure that no jerk mounts the sidewalk and parks illegally). As seen in the aerial above, the bracing actually only covers a small portion of the sidewalk and adjacent parking spaces currently blocked. The area between 35 Weybosset and Turks Head was blocked in anticipation of the construction work for OneTen. OneTen is not being built for the foreseeable future so this portion of the sidewalk and street can be re-opened. The extended sidewalk and making Weybosset one lane wide will also have a good traffic calming effect. The extended sidewalk lines up nicely with the corner of Custom House Street allowing for a comfortable crosswalk at this point. Making Weybosset one lane in this area will also slow traffic which tends to move fast through the area at off hours when there is not much traffic. Room remains in the street further down for the bus stop before the Turks Head intersection. The facade left standing as is still needs some attention to ensure it does not deteriorate. The back of the facade requires parging to prevent water infiltration from the back. The remaining windows should be removed and the window openings stabilized. With proper care and preparation, there is no reason the facade cannot stand until such time as a more permanent solution for the parcel is possible. One may argue that the bracing itself is an eyesore. That is a valid opinion. I do not believe it is an eyesore, but even if one feels it is, I would argue the eyesore is a small price to pay to save such a handsome facade that could again be a contributing part of the streetscape. Some interesting things could also be done to make the bracing more attractive. Perhaps make it an annual design project for a group of RISD students or RISD students working with New Urban Arts. With a little bit of creativity (which Providence has no lack of) the bracing and facade could become an attraction in and of itself. The city is looking for a permanent solution to the pavement problem on Weybosset Street. This is a temporary solution, but in this case, temporary could be a decade or more. By the time something permanent is built on this parcel, Weybosset well may need to be paved again. I think we should view this as a permanent condition for the purposes of deciding how to get Weybosset repaved (as it desperately needs). This is certainly not a no cost solution. But it need not cost O’Connor terribly much. 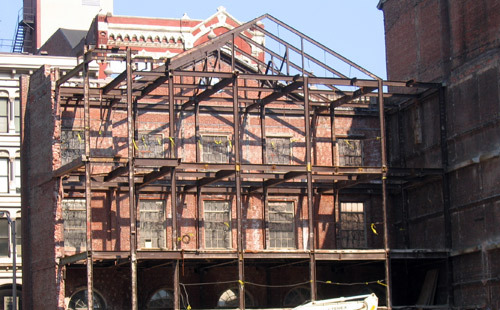 The stabilization of the facade will cost O’Connor, but that is something that was agreed to when the the rest of the buildings on the lot were torn down, it should not be considered an added expense. If the bracing were flipped to the backside, the stabilization work would still need to be done. The creative renewal of the bracing could maybe be done with some art grants. The street and sidewalk work is something the city needs to budget for anyway, but it is probably fair to ask O’Connor to foot part of the bill for the new sidewalk construction and bollards that would need to be placed out front of the bracing. Could this cost as much as moving the bracing to the back would? Perhaps, the numbers need to be run to find out which option is the most economical. What about the rest of the parcel? Well, O’Connor is looking for parking. I’m loathe to favor more surface parking Downcity (or anywhere in the city for that matter). But if the facade remains, surface parking become slightly less loathsome. 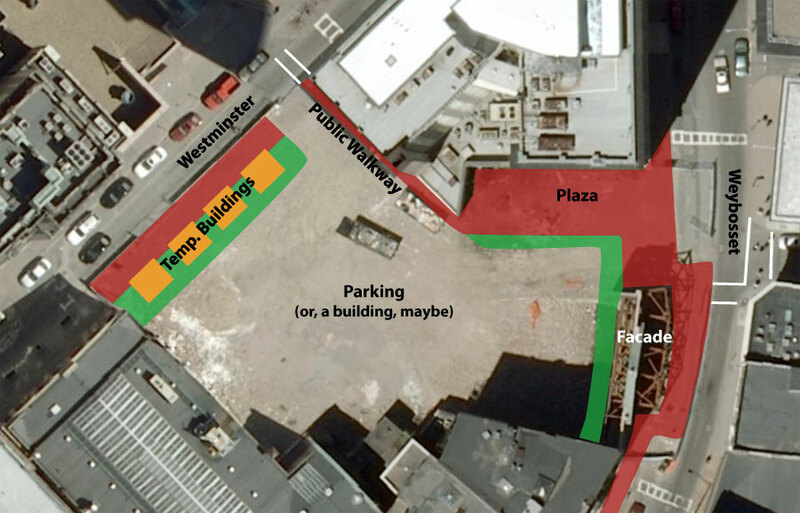 In order to have surface parking, it is required for there to be a landscape buffer along Westminster Street. The landscape requirement is pretty feeble unfortunately, a 3 or 4 foot strip. A couple months ago we looked at some temporary architecture in San Francisco. The San Francisco proposal was pretty adventurous for a temporary solution, but like here, they were looking for something to do with a highly visible parcel until such time as a permanent solution was economically feasible. A temporary architecture solution need not be so elaborate. Along the waterfront in Hyannis for example they have basically tool sheds from which artisans sell their wares. Something like that could be done at the very least seasonally along Westminster Street. Pop up retail is a concept that is taking root in Providence. Some sort of retail kiosks, with landscaping and lighting along Westminster, the facade saved along Weybosset, and a walkway through the parcel between the two streets would make surface parking in the center of the parcel more palatable. Above, a quick drawing of what could be done with the site. Of course those temporary buildings could be larger, and an option other than parking would be nice, suggestions? Please share your thoughts of what should be done with this parcel in the comments. Terrific ideas on what to do with this parcel- great way to move forward! Temporary buildings is a wonderful solution that would also incorporate back-of-building surface parking as sought after by the developer. By no means am I a supporter of surface lots, however, this is a great compromise solution that would benefit the city, its residents and business owners and developer. Something like the Box Office [gcpvd.org 2009/11/06] project would be a perfect fit for this size parcel and would complement the historical notion of a former industrial city with its current creatives initiatives. These are excellent proposals! How can these ideas be presented to the DRC? Would they be presented as public comments during an official meeting and/or can they be forwarded ahead of time for review to the DRC and also perhaps to the DPD and the Mayor’s office? Besides the posting on this site, should this material be published in print media to make a larger segment of the public aware of other alternatives? If anyone is aware of any grants, artist or otherwise, that might be available to offset some of the costs the DRC should be made aware of their availability. This would offer the DRC positive alternatives that would help in their decision that would benefit both the city and the developer. I like the option of building a pre-designed structure that would allow the future build-out of OneTen. The temporary building idea is also good and might meet the financial aspect better as it impacts the owner. DRC agenda was posted today, December meeting is indeed cancelled. Jef, you know what I like about your suggestions to re-brace from the back or re-align the sidewalk? They both cost O’Connor (or another developer in the future) something in the long term. I mean that, as long as that facade remains, there will be continuing costs associated with its maintenance. I say that, not for spite, but rather because, even if most of this lot is destined to be temporary surface parking for some length of time, there will be a continuing incentive for the developer to do something productive with the lot as soon as it becomes realistic to do so — a nagging thorn in the developer’s side, so to speak, a constant reminder to the owner that surface parking is NOT the highest & best use of the property. The Silver Top Diner, currently sitting disused in Pawtucket. Photo from Art In Ruins. Poirier’s Diner, currently sitting disused on Westminster Street on the West Side. Photo from Art In Ruins. The diners need a home, the Westminster site needs something on it. 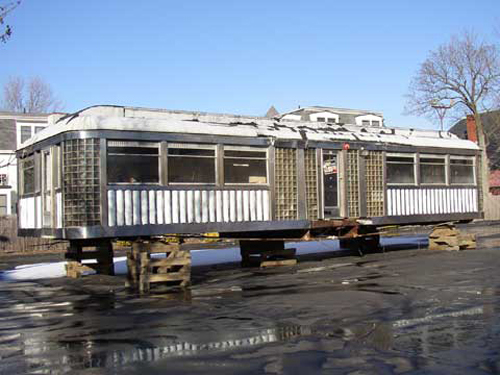 For 5 years, a decade, however long it takes to develop the site, we’d have a functioning diner on the site. O’Connor would collect rent, a quiet end of Westminster would have off-hours life in the form of diner patrons, area hotels would have a new place to send guests… Install one of the diners on at the sidewalk edge, and O’Connor will still have room in the center of the lot for other uses. Jef – that is the most fabulous idea that I have ever heard. Someone up top seriously needs to hear about this. I completely agree – what an awesome idea. Heck, this would be great for any of the emply lots in/around the core. The Box Office might offer another possibility for a temporary use of the faÃƒÂ§ade. Place container(s) behind the faÃƒÂ§ade with window cuts to use for retail at the ground or studio space on upper two floors, though the ground floor arcade might make stacking containers for the two top floors problematic. The applicant has requested another extension and this month’s DRC meeting is cancelled. 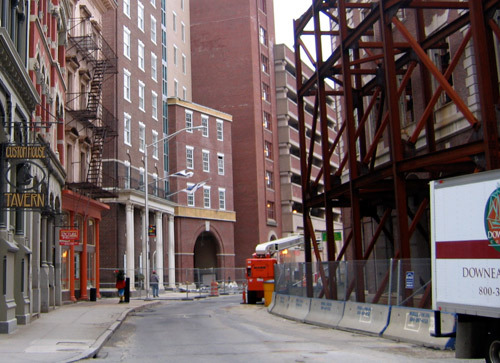 PBN is asking in a poll if the 35 Weybosset Facade should be removed. Feel free to go there and vote no. Word on the street is the current owner has given up and is trying to sell the property as is. I have not been able as yet to confirm that by finding a listing for the property or verifying that any other way. Click on “more polls” and then select the poll for this one, which is the first one. 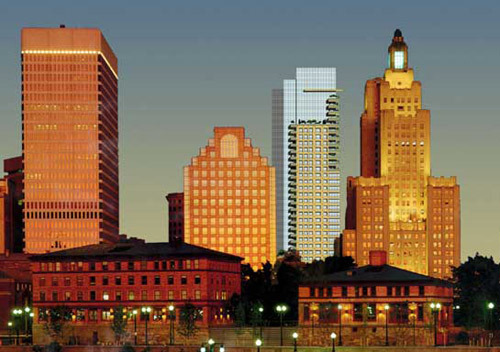 Still, Vornado’s exit could be seen as a step forward, since the firm’s executives are out of favor with Menino, who has made redevelopment of the Filene’s block a top priority. In March, Menino accused Vornado executives of deliberately allowing the property to become blighted in order to pressure the city to provide funding or other help. 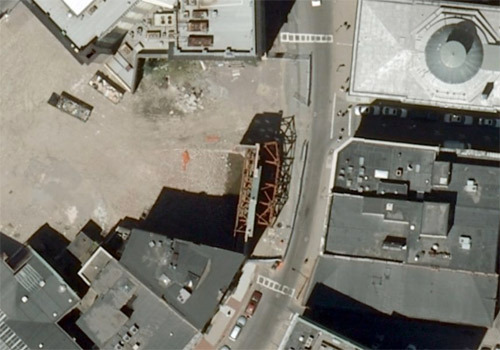 “This development is too important to Downtown Crossing and to the entire City of Boston to be used as a bargaining chip to improve your bottom line,” Menino wrote at the time. Wouldn’t it be nice to see our mayor taking a hardline on OneTen or any other stalled blight currently plaguing this city? Sure, on Menino’s part it is mostly just hot air, but hot air is nice sometimes, isn’t it?